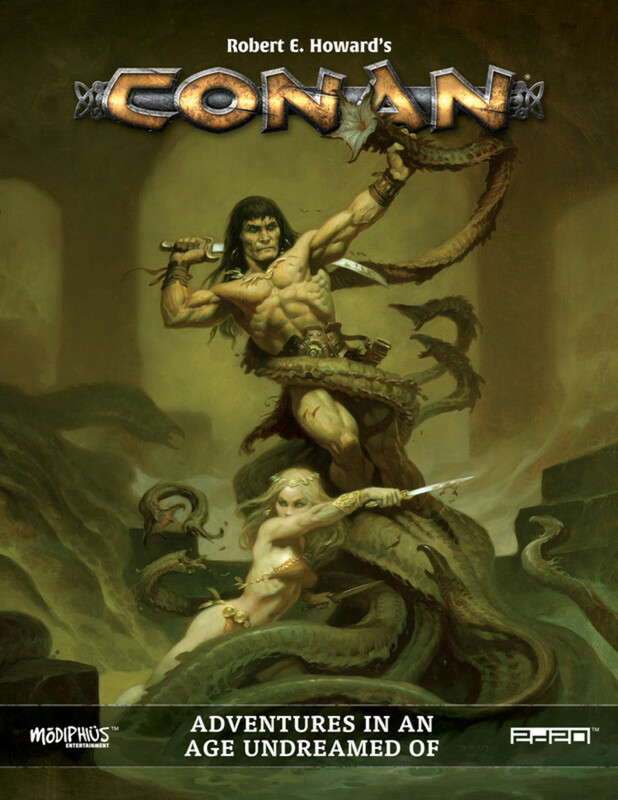 I already ran through my initial review of Modiphius’s Conan, providing my initial thoughts and even running through a full example of character creation. I did not talk much about the actual rules of the game, though. There are reasons for that. Still new to the game, I’m still trying to figure those out. I like what they have done here and want to see them succeed, so want to be careful by not giving away so much that people don’t need the book. Playing and running some tests solves the first issue for me. I believe I managed to solve the second issue by explaining enough, but not too much here. Don’t get me wrong, while I have omitted some things, what I have here should make sense. If there’s confusion with what I write, let me know. This is a roleplaying game, right? Like any other RPG, you roll when necessary. 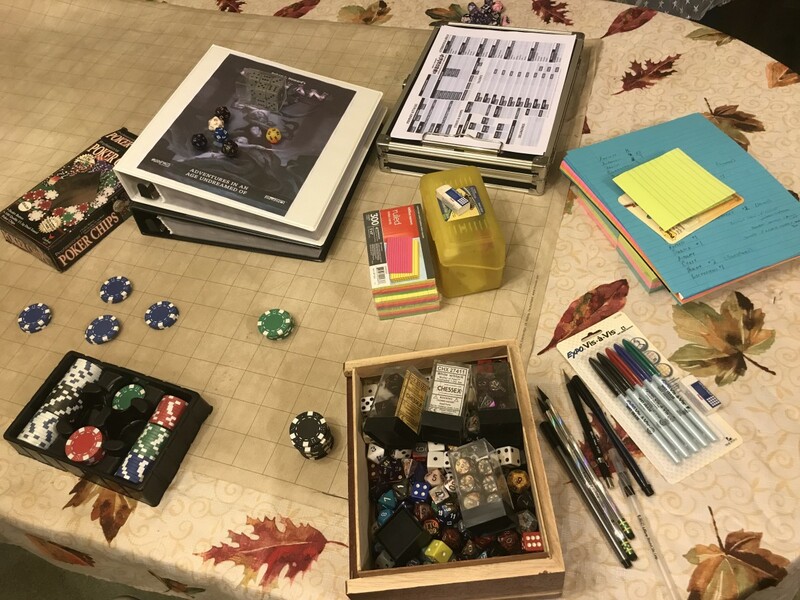 I can draw comparisons between older versions of Dungeons & Dragons, World of Darkness, and even the Marvel Super Heroic Roleplaying Game. However, for me, the base mechanic is something new. Granted, I have not played every game out there. I also am not familiar with other 2d20 games by Modiphius including Star Trek Adventures and Mutant Chronicles (I played 1st and 2nd of that, but not 2d20). Here’s how it works. 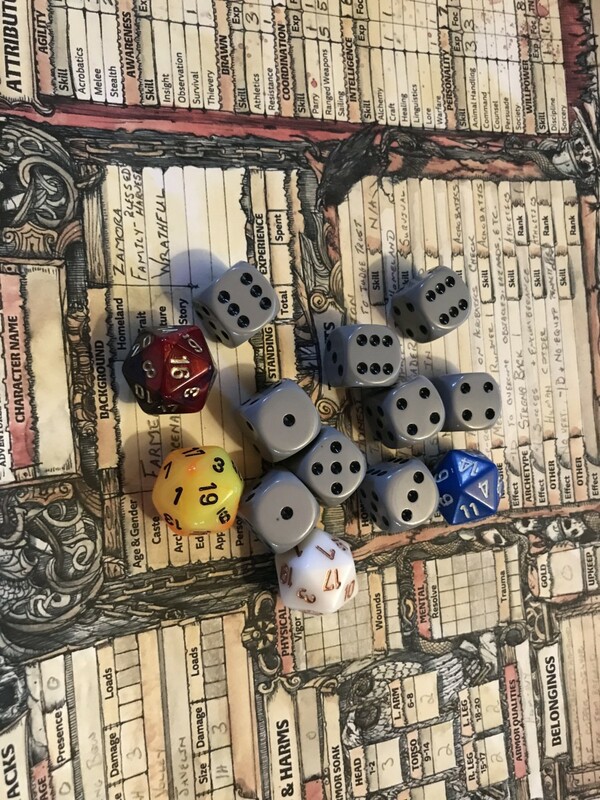 When the Gamemaster calls for a roll, you roll two twenty-sided dice with the goal being to roll equal to or under your character’s Attribute + Skill. So, if you are trying to climb a cliff, you take the character’s Agility of 10 and Climbing expertise of 2 and your goal would be to roll 12 or less. For each dice that comes up 12 or less in this example, it counts as a success. Most things in the game are rated by a difficulty score represented as Dx where “x” is how many successes you need. So, D1, you need one success and D4 means you need four successes. These difficulties go as low as D0—needing no successes or an automatic success—to as high as D5—need a total of five successes. But, if I am only rolling two dice and each one can be one success, how can I get five successes? Great question. There are ways to improve your character’s chances and roll more dice, but you can never roll more than three bonus dice on a single roll. So, if you are staring down the barrel of a D5, you’re going to need to have luck on your side. I’ll talk about how you can get those bonus dice shortly. The Conan Adventures in an Age Undreamed Of core book provides plenty of examples for you when it comes to setting difficulties. Everything from terrain and lighting to wounds and familiarity can have an impact on a task’s difficulty. I’ve always been a big fan of critical strikes and fumbles as well. Those are possible in this game, but not necessarily the way some other games handle it. In fact, it kind of seems a mix of how I have seen other games do it with a mixture between mechanical and narrative. Modiphius’s 2d20 system also makes use of d6’s, or six-sided dice. 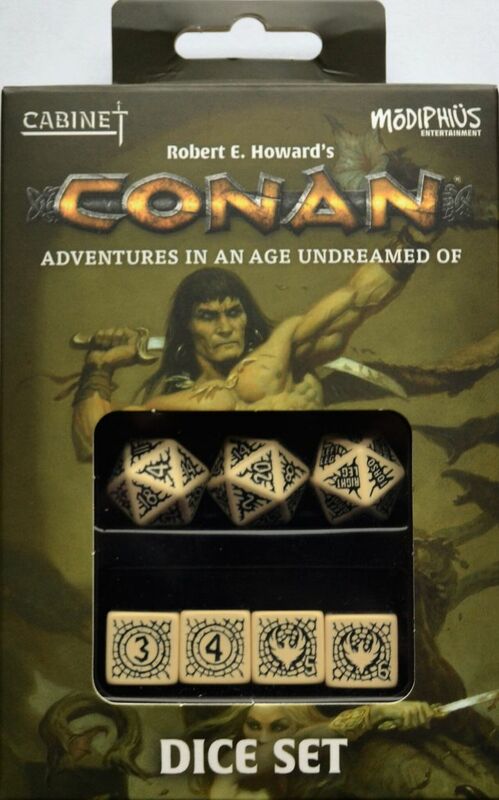 They offer up their own version of these dice, suited specifically for the Conan Adventures in an Age Undreamed Of RPG, but you can use your own six-sided dice as well. The FATE system uses specialized d6’s as well which kind of reminds me of how this game uses the same. In FATE, two sides are a plus, two sides are a minus, two sides are blank. In Modiphius’s Conan, 1 represents one, while 2 represents two, the 3 and 4 represent nothing (or, blank), and the 5 and 6 each equal 1 “plus.” That plus is my shorthand for “plus an effect.” Different weapons and types of attacks can fire off different types of effects. For me, it’s a bit odd imagining the middle results on a roll equaling, for all intents and purposes, nothing. The Conan dice are one way to help wrap your head around this. Besides determining success or failure in an attack, the d20 can also be used to determine hit location and Modiphius’s custom dice have those locations printed on the different sides. What are All These Poker Chips? 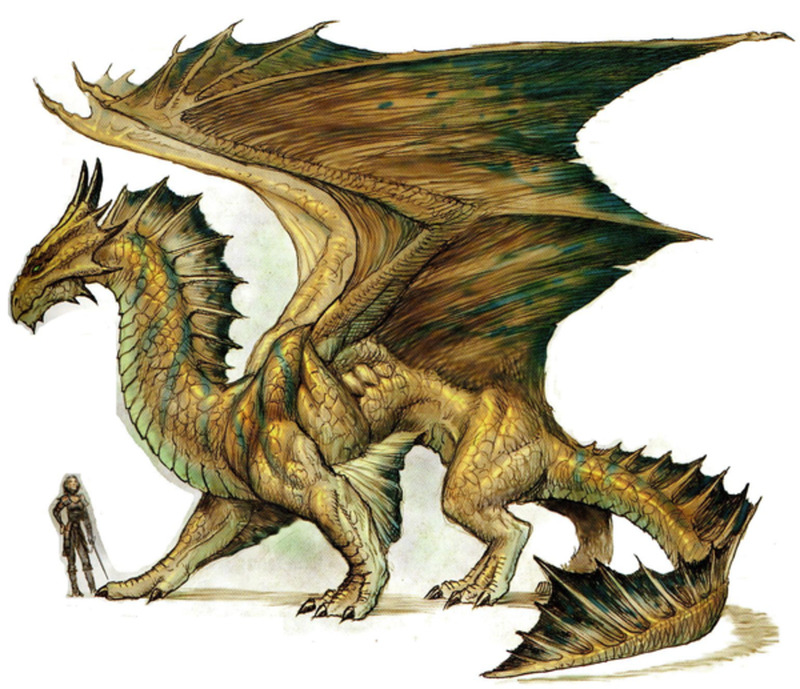 There are a number of physical objects used in different roleplaying games. Some, in fact, have none. Going down this road can be a lengthy discussion and debate about what exactly a roleplaying game is, but we’ll avoid that for now. 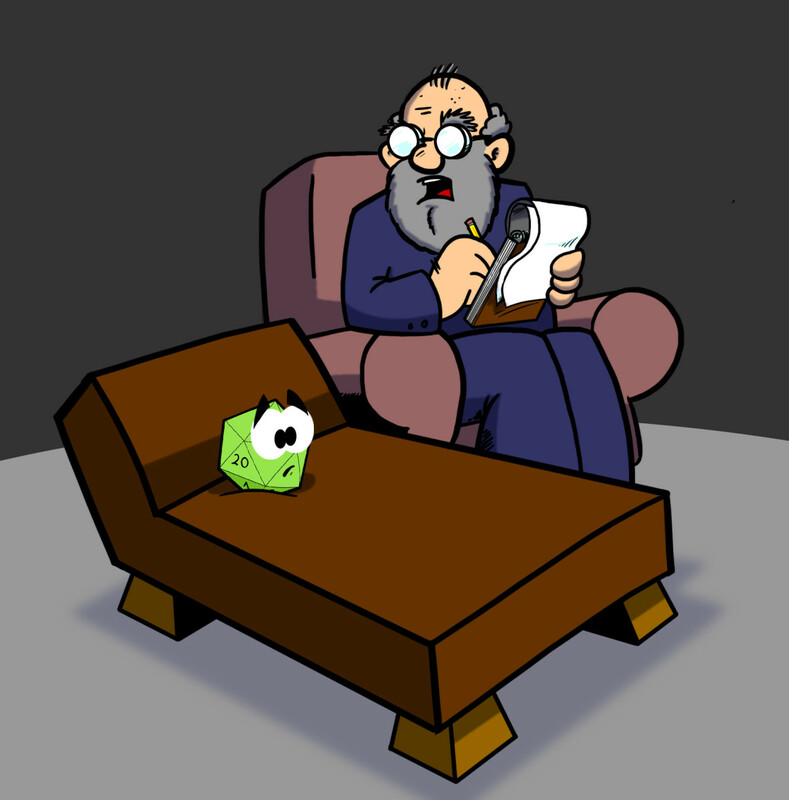 Traditionally, tabletop RPGs use different polyhedral dice to carry out mechanics rules. There are also games that use a standard or specialized deck of playing cards. Some will use miniature figurines and model scenery. Beads, poker chips, and tokens aren’t all that uncommon either. Modiphius’s Conan game uses twenty-sided dice and six-sided dice. We already talked about those a bit. However, this game also has different types of in game currency that players and the gamemaster will spend throughout the game to accomplish different things. A number of games have sort of in game currency that is represented by tokens—anything from Savage Worlds to Pathfinder. One thing that makes this in game currency kind of unique here, however, is that there are multiple kinds. Fortune, Momentum, and Doom points are all gathered into pools and the rules encourage a healthy ebb and flow between them. For now, I am using three different colored poker chips to represent these points at the table. 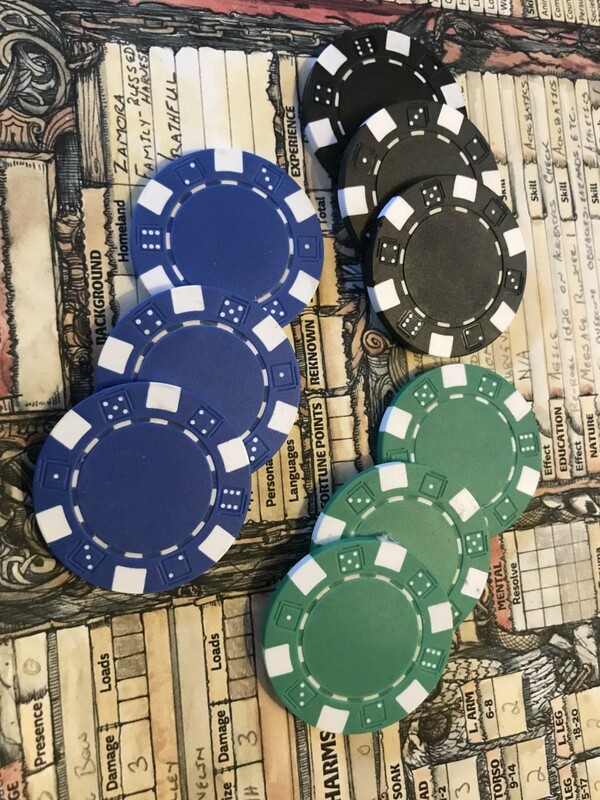 I am using black chips for Doom points, green chips for Momentum, and blue for Fortune. Every character in the game gets a certain amount of Fortune points at the beginning of the game. These are probably some of the easiest for players who are familiar with other games’ in game currencies. They can be used to add bonus dice to rolls, perform additional actions, or influence a story. They’re not an automatic “I win” button, but they can improve the epic nature of the nature of the game. Momentum points are a bit different. These are built up with extra successes throughout gameplay. 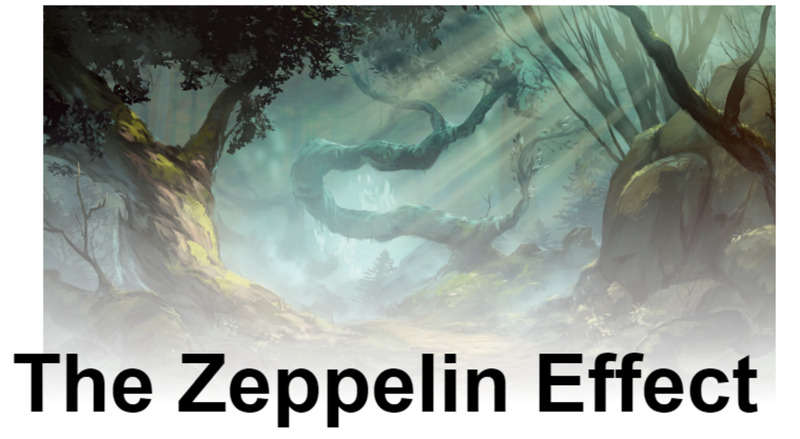 They are used to empower effects, increase effects of a roll, and more. There are a few interesting things about the Momentum pool. First, it can be invoked on the same roll that generated the points. Next, there is one pool—limited to six—for the group of players to share. Finally, this is called a Momentum pool, it’ll go away even if you don’t use it. Points from the pool can and will disappear at the end of turns. So, you’ve got to spend them while you’ve got them. The Doom pool represents the strength of the threats the GM pits against the players. While many will say the GM should be a fan of the players—even Modiphius—the Doom pool sets up a truly adversarial relationship between the players and the GM. My first experience with a Doom Pool was the Marvel Super Heroic Roleplaying. It was odd to me at first, but quickly made sense. If you’re familiar with Doom points from that game, understanding the Doom Pool for this game should be relatively easy. At the beginning of the game, the Doom pool is generated according to the number of players in the group. The pool builds up from a variety of sources—most likely from actions the players themselves choose. Trying to defend themselves rather than soaking a blow can add a point to the Doom pool. Trying to do something that would normally cost Momentum without having the Momentum to spend will add points to the Doom pool. Those are just too examples. There are others. The idea is that for every bit of luck on the player characters’ side, there is a balance that must be maintained. This lends itself well to the dangerous sword and sorcery world of Conan. The better things go for the characters, the more likely something bad will happen sooner rather than later. 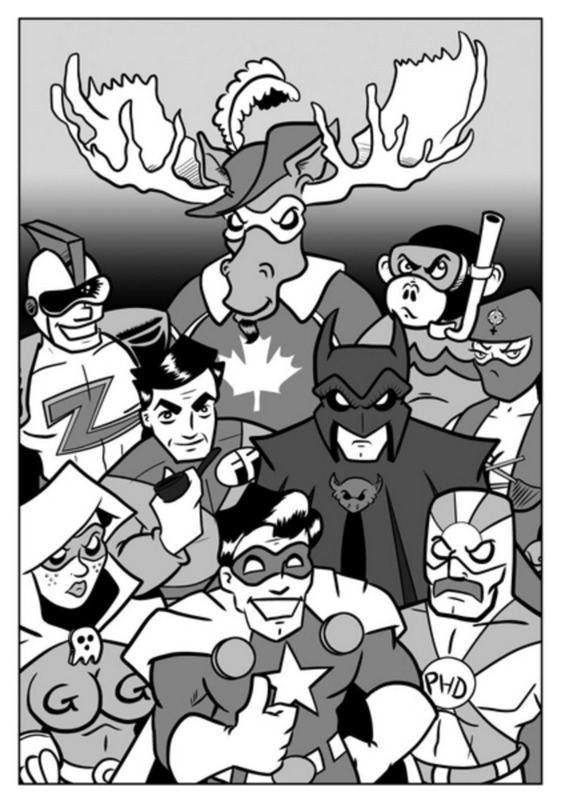 The gamemaster will end up spending points from the Doom Pool to thwart the character’s heroic efforts. Those points might add different hazards to the playing field, bonuses to enemy combatant rolls, and other nasty stuff that player characters will need to overcome. Conan Adventures in an Age Undreamed Of can be a brutal and unforgiving game. While player characters can accomplish might feats and become the stuff of legend, their battles are hard-fought. As a kneejerk reaction, many players—especially those new to the game or those used to playing near-superhero characters—will restrict their own actions to avoid granting the GM any points to their Doom Pool. I Have a Battle-Axe. I Have One, Too. In most roleplaying games, gear is an important facet of the character. Players will often choose their gear based on one of two things: 1) it looks cool or 2) maximum mechanical benefits. In those other games, mechanical benefits are usually straightforward—number of damage dice or bonus to hit. It is different in Modiphius’s Conan. The equipment section gives a large selection of weapons, armor, and other gear to choose from. Weapons and armor do different amounts of damage and soak respectively, but they all have a different variety of traits as well. Some weapons have more reach, making it easier to attack or defend. Some will stand a better chance of delivering piercing or lasting damage. 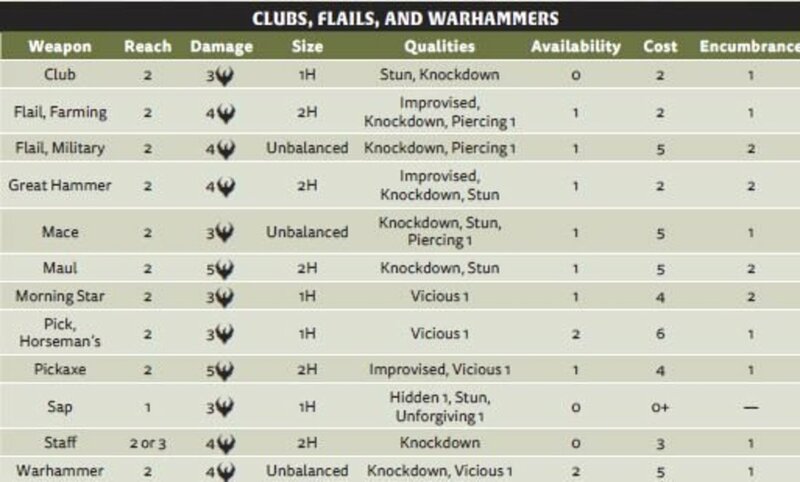 These qualities can be of different ranks—some providing more bonus damage than others, for example. Armor, meanwhile, can protect different parts of the body in different ways, even adding qualities that can have a direct effect on the mechanics. One thing that came up here was the ability to stack armor. Just as in most games, you cannot stack the benefits of armor on top of one another. I get this, from a mechanical standpoint, but also have my own issues with it. Yes, it’s a roleplaying game, not simulationist fantasy. But, let’s say I have a heavy cloak offering protection and that sits over top of a chainmail hauberk also offering protection. An arrow strikes me in the back. Either the cloak can protect or the chainmail, but not both. Forget that it has to go through the cloak to get to the armor. Pick one and only one. This does not mean there is no reason not to wear both the cloak and the chainmail, though. This Conan RPG has a sacrificial armor rule. So, I might sacrifice my cloak to completely negate the damage from the arrow strike. It’s no good anymore, but the chainmail is still there. One other thing to keep in mind is that Conan Adventures in an Age Undreamed Of is how wealth works. They make use of a Wealth system complete with basic upkeep costs. So, unlike other roleplaying games, where players meticulously calculate and track wealth including various coins, gems, etc., it becomes a little less important in this game. This also feeds in the Renown and Status system they have built up. It makes a lot of sense to tie all these together and it’s perhaps the only time I have seen it in a roleplaying game. Granted, what I have written here is just a brief overview of the rules. Some games have few rules and take a lot more to explain. To some, however, Modiphius’s Conan Adventures in an Age Undreamed Of looks like it has a lot of rules. It sort of does, but they fit together nicely like a new set of Legos, though. They don’t have rules just to have them either. At first, the rules may seem a little overwhelming. I still have the book ready for reference during the game and that is happening more now than it will in the future, already less than it did when I first started. The reason for this is because the system just makes sense. As you see how everything comes together, you start to know how the rules will most likely work and—in my experience—you will end up being right. There are plenty of games with more rules than Modiphiu’s 2d20 Conan. There are also plenty of games with fewer rules. Everyone needs to find the game and the system that sits well with them. I play and enjoy a number of games, but this one is consuming most of my gaming time these days. I even have the kids playing it and they are understanding the rules without confusion.